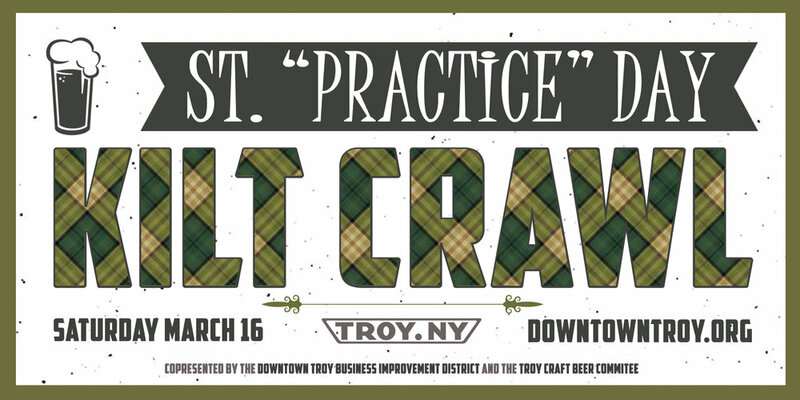 Join your favorite Troy bar or restaurant as we warm-up for St. Patrick's Day! This downtown pub crawl will travel through the Collar City, challenging participants to plot their own course and try one of our many new and exciting businesses while at the same time bringing you back to your all-time favorites. As you stop at various spots around the city, have your passport "stamped" -- the more stamps, the more chances you have to win great prizes from our various sponsors. Passports can be redeemed for prize tickets at the Takk House Parlor at 8:00pm. Prizes will be awarded at random between 8 and 9 pm. Register early for the chance to win special-edition prizes! The Ale House, The Bradley, The Ruck, Wolff’s Biergarten, and Ryan’s Wake.